The article is very good but surprisingly makes the same mistake as so many other reviews which is to test with only 512MB of ram. The intel imac is a much better machine with more ram and it doesn't make sense to test it with the minimum amount. Also Universal apps are coming fast and furious on a daily basis. I've got 1.5 GB of ram in mine and lots of the little apps I use everyday are already UB and are nice and fast as is the OS and iLife apps. It won't be long before Windows runs on these as well as Linux with Red Hat promising support. Check out Bare Feats for some pretty nice benchmarks including games. Yes, Quake 4 will actually run at a decent speed as well as COD 2. Also, your assertion that the Core Duo is a "public beta" is absurd. You had zero problems running applications. 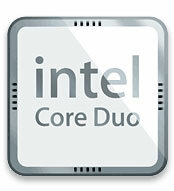 Word from those around me that are testing Core Duos is that for most applications, you don't even notice Rosetta. Pro Apps users would complain, but they're never early adopters, because their apps always lag at least a few months behind the latest platform (remember the "multiprocessor plug-in" that allowed Photoshop to limp along for so long before a "MP-native" version was released?). This is a solid platform transition, likely exceeding the fairly solid (albeit far more daunting for the day) transition from 680x0 to PPC. He says he already had an iMac so in order to compare the two I'm guessing he bought the closest-matching one possible. I would hardly do to have an 20" iMac compared with a 17" one in power consumption or running at a different native resolution. I do agree that the RAM limits the system insanely but he went for default specs rather you start improving all the draw backs each system has. I'm guessing its actually the laptop X1600 in the iMac, soldered onto the motherboard. Unfortunate, yes, but given the primary audience that the iMac is targeted at, I'm not surprised. I read somewhere that the 9600 in the second generation iMac G5 was a laptop part, and I therefore assumed that since Apple used the same GPUs in the iMac that it used in PowerBooks (GeForce FX5200, Radeon 9600, X1600), it was sourcing the same parts for both lines. Any idea which compilers apple has used for their apps? For example, for the PPC apps I assume apple uses the IBM compiler heavily optimized for PPC instead of GCC. Perhaps it's just me, but the non native apps I run seem to run at about the same speed as they natively ran on my G5. While the universal binaries run much faster.